Wallflower – Mirror, rorriM was exhibited as part of Mildura Palimpsest #8 – the Biennale of the Bush. Two drawings based on segments of native Australian orchids, incorporating animal fur and presented on a repeated pattern of William Morris wallpaper design hang in a small cube like room in the basement of Rio Vista. 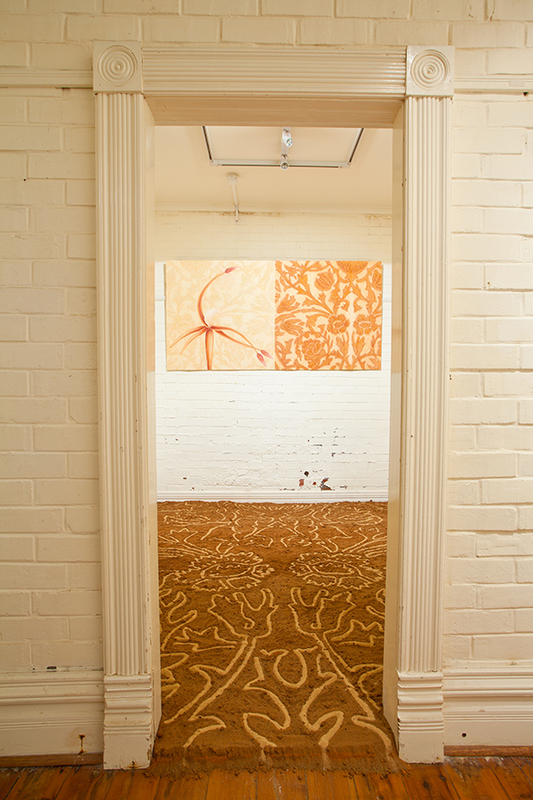 On the floor is a carpet of Mildura dirt which has the William Morris design inlayed in Murray River Sand. Contained within the small cellar in the basement of Rio Vista (the original Chaffey home), the work draws on Mildura’s history of colonization, the introduction of irrigation and the subsequent migration of Italians to the area. SBS Studio TV were in Mildura and produced a short documentary on the festival which included and interview and visual footage of this installation.